Census Citizenship Question: Jeff Sessions Told DOJ Not To Discuss Alternatives After receiving a Justice Department request for a new 2020 census question, the Census Bureau came up with another way to generate more accurate citizenship data. The DOJ refused to meet about it. 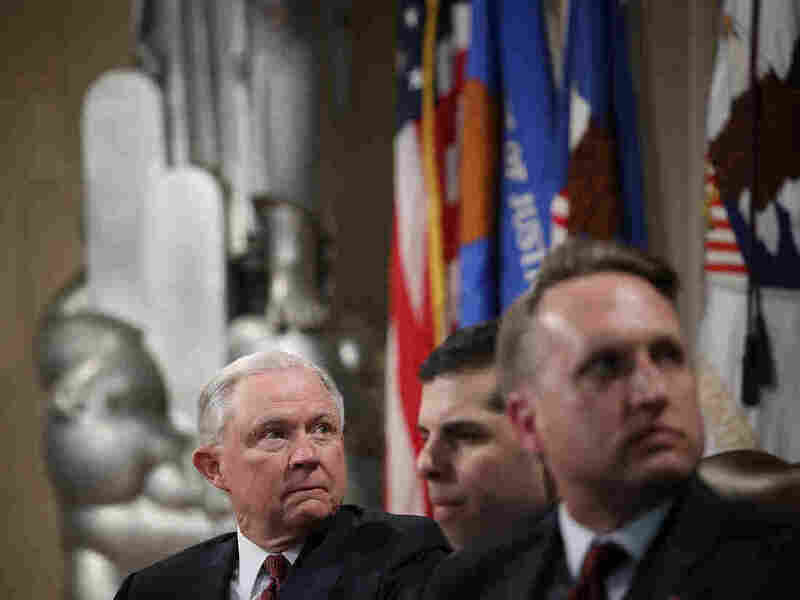 U.S. Attorney General Jeff Sessions (left) and Acting Assistant Attorney General John Gore (right) attend an April event at the Justice Department in Washington, D.C. Gore reportedly has testified that Sessions directed the DOJ not to discuss alternatives to the 2020 census citizenship question with the Census Bureau. Last December, the Justice Department sent a letter to the Census Bureau asking for the hotly contested question to be included on forms for the upcoming national head count. Commerce Secretary Wilbur Ross, who oversees the census, responded in March by approving plans to add the question. But days after the Census Bureau received the Justice Department's request, its staff concluded that collecting people's self-reported information through the census would not be the best way to generate better citizenship data. Instead, compiling existing government records about people's citizenship status, the bureau found, would not only produce more accurate information but also cost less money. To top it off, research by the Census Bureau suggests asking about citizenship status in the current political climate could discourage noncitizens, including immigrants living in the U.S. illegally, from taking part in the constitutionally-mandated head count of every person living in the U.S. That would harm the accuracy of the information collected through the census, which is used to distribute congressional seats, Electoral College votes and an estimated $800 billion annually in federal funding among the states. The bureau's acting director, Ron Jarmin, tried to set up a meeting with Justice Department officials to discuss the bureau's preferred method for gathering citizenship information and to better understand how the DOJ wanted to use the data. That discussion, however, never took place, and the head of the Justice Department — U.S. Attorney General Jeff Sessions — made sure of it, according to the deposition of a key DOJ official behind the citizenship question. In a newly released court filing in preparation for the first trial of the citizenship question lawsuits, the plaintiffs' attorneys wrote that John Gore testified out of court Friday that Sessions "personally made the decision to direct DOJ not to even meet with the Census Bureau to discuss alternative approaches." The attorneys cite Gore's testimony to back up their claims that the decision to add the citizenship question was a misuse of the commerce secretary's authority over the census and intended to discriminate against immigrant communities of color. A spokesperson for the Justice Department, Kelly Laco, declined to comment. Last week at an event in Washington, D.C., organized by The Heritage Foundation, Sessions criticized a U.S. district court order allowing the plaintiffs' attorneys to question Ross under oath about why he added the citizenship question. The Supreme Court has put Ross' deposition temporarily on hold. "The words on the page don't have motive. They are either permitted or they are not," Sessions said during his speech. He later noted, "Decision-making is improved when decision-makers can have candid and open conversations." Gore's testimony is the latest in a series of revelations from court documents that detail how senior Trump administration officials pushed to use the 2020 census to ask about citizenship status. The Census Bureau has not asked all U.S. households about that topic since 1950. Dozens of states, cities and other groups are suing to stop the Trump administration's plans to bring back the citizenship inquiry to the census. In recent weeks, the administration's attorneys disclosed that Ross now recalls a spring 2017 conversation with then-White House adviser Steve Bannon about adding a citizenship question. In March, Ross testified in Congress that he was "not aware" of any discussions on that topic with the White House. Bannon connected Ross with Kris Kobach, the former vice chairman of President Trump's now-disbanded commission on voter fraud, who suggested wording for the question to the commerce secretary. After Ross told lawmakers that the Justice Department "initiated" the request for the question and that he was "responding solely" to it, memos and emails released as part of the lawsuits made clear that Ross and his staff began working on getting the question onto the census shortly after he was confirmed as commerce secretary in February 2017. In fact, Ross' staff approached Justice Department staff about the question first, and the DOJ initially did not want to make a request. The Trump administration had tried unsuccessfully to shield Gore from having to sit for questioning under oath by the plaintiffs' attorneys. He serves as an acting assistant attorney general who has led the DOJ's civil rights division. The administration argues that division needs responses to the new citizenship question to better enforce the Voting Rights Act. Input from subject matter experts is essential to the development of a new question. For decades, the federal government has relied on citizenship information to make sure the voting power of racial and language minorities is not diluted. Since the Voting Rights Act was enacted in 1965, the Justice Department has enforced the law's protections against discrimination by using estimates of U.S. citizens from a Census Bureau survey now known as the American Community Survey. About 1 in 38 households in the U.S. are required by law to complete that survey every year. In its December 2017 letter to the Census Bureau, however, the Justice Department said that collecting citizenship data from every household through the once-a-decade census would be "more appropriate" to use for enforcing the Voting Rights Act and redistricting. Still, Gore does not seem sure whether the data collected from the new citizenship question would be more accurate. According to the plaintiffs' filing, Gore testified Friday that "he does not even know if citizenship data based on responses to a citizenship question on the census will have smaller or larger margins of error, or will be any more precise, than the existing citizenship data on which DOJ currently relies." Former Census Bureau Director John Thompson, who is serving as an expert witness for the plaintiffs in the two lead lawsuits based in New York City, has expressed concern that the DOJ did not follow the usual step of conferring with the bureau's staff after submitting its request for a citizenship question. "Input from subject matter experts is essential to the development of a new question," Thompson wrote in a court filing from September. "Without these discussions, there is a significant risk that the resulting citizenship data will not meet [the Justice Department's] needs." "Dr. Abowd stated that the Census Bureau still doesn't know how the responses from the citizenship question will be combined with administrative records to form the tabulation of block-level citizenship data, the details of how the citizenship data will be altered to prevent disclosure of respondent's citizenship status, whether the citizenship data produced after the 2020 Decennial Census will have larger or smaller margins of error than the citizenship data currently relied on by the Department of Justice, whether the error margins associated with the data will allow the Department of Justice to use the data effectively, or even whether the block-level data will be included in the standard redistricting data file produced by the Census at all." For now, the trial for the New York-based lawsuits over the citizenship question is scheduled to start on Nov. 5. This week, a U.S. district judge and the Second U.S. Circuit Court of Appeals rejected the Trump administration's efforts to delay the proceedings. Its attorneys, however, may soon file a similar request with the Supreme Court.